We still managed to see some sights in Southern Colombia in our rush for the Colombia-Ecuador border. We stopped for two nights in the lovely white-washed town of Popoyan, a convenient resting place as we had been putting a lot of miles on our car in the last couple of weeks. 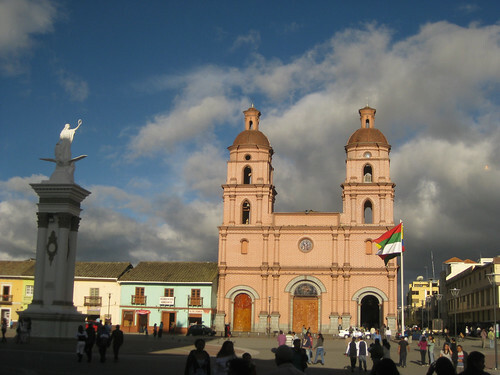 The car and motorcycle traffic in the town couldn’t spoil the beauty of the old colonial buildings and squares, and we spent the day catching up on email and wandering its slightly noisy streets. We then pushed on for the border town of Ipiales. We were surprised to find a thriving small city, the streets filled with people shopping for Mother's Day. Since we left the US, the border towns in Central America tended to be slightly depressing or uninteresting small towns, so Ipiales was a nice change of pace. Before crossing the border, we visited the beautiful Sancutuario de las Lajas the next morning. A dramatic steep canyon carved by the Guaitara River cuts through the countryside in this area of Colombia. Deep within the canyon and surrounded by waterfalls, the church was built upon the miraculous site of the appearance of the Virgin Mary in the rock of the canyon's wall. The church was built around this rock that forms the high altar of the church. The walk down to the church is lined with small plaques of devotion and thanks to the Virgin Mary, and Sunday Mass was in full swing as we walked around the outside of the church. It is perched on the cliffside halfway down the canyon wall, and we admired the view before puffing our way back up to our car. We still feel quite effected by the high altitude, but hopefully more time will acclimate us better. After visiting this holy place, we experienced a small miracle of our own: a hassle-free border crossing. 5 minutes to exit Colombia, 45 minutes to enter Ecuador and receive our car import permit, and no hoards of people thronging our car offering to ‘help’ us through the border crossing. It seemed too easy after the chaos of Central America, but here’s hoping that the remaining South American borders will be equally tranquilo. A couple of hours later we arrived in Quito, where we spent two days organizing our car and finalizing arrangements for our trip back to the US. In typical wonderful Colombian style, the nephew of friends of the parents of the family we stayed with in Bucaramanga and Bogota had kindly offered to lend us a parking space in his garage for the 3 weeks we would be back in the US. 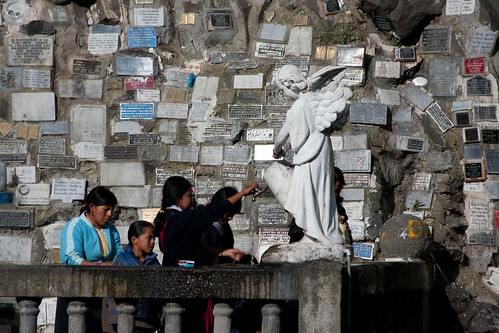 We’ll be returning to Quito in 3 weeks to resume our trip. my wife and i are planning to make the drive too. Hi Jimmykchu, thanks for the compliment, and I hope you do make the drive. You may want to check out the Drive the Americas website we created with some friends. 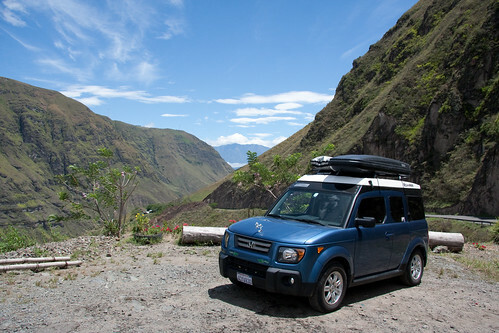 Drive the Americas is all about helping people travel by car through North and South America. As for the map gadget, you can find it at the Fireeagle Badge website. Here is how it works: Fireeagle is a website that has hooks into all kinds of websites and devices. When you update your location with the device or manually at the Fireeagle website, Fireeagle will publish your location to any apps you have registered, like that Fireeagle badge. I wish the Fireeagle Badge would allow me to default to a zoomed out view by default, but that is my only complaint. BTW- I am updating our location using the SPOT locator, a GPS device that allows you to track your location. knew where we were all the time.